Shelley Hultman, BSN, RN, knows all about Methodist’s commitment to providing outstanding care. As a nurse in the Methodist Hospital Emergency Department, she often sees patients and their families during stressful and emotional moments. But she experienced The Meaning of Care in a whole new way after her mother was diagnosed with a rare colon cancer. She was so moved that she had to recognize the team responsible. Patty had worked at Methodist Hospital for 15 years, first as a manager for cardiothoracic surgeons and then for vascular surgeons. She moved on to work at First Eye Associates at the nearby 8111 Building before retiring. “She liked to stay close to the hospital because she shopped in the gift shop every day,” Hultman said. In the fall of 2016, Patty discovered she had a rare colon cancer. That started what become a “whirlwind of a year,” Shelley said. 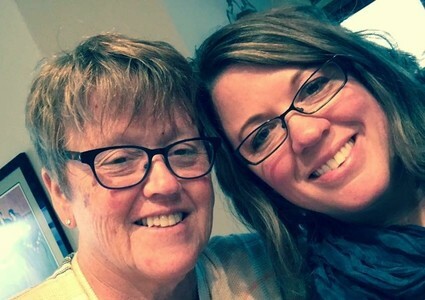 Appointments and surgeries followed, and there was a brief stay on the Methodist Hospital oncology floor – an experience Shelley remembered fondly because of the “wonderful” staff. But after a visit to the emergency room nearly a year later, doctors had bad news: The cancer had spread. Patty was admitted to Methodist Hospital and returned to the oncology floor. As the family learned how little time Patty had left, the team’s commitment and support became evident. A nurse herself, Hultman was used to answering medical questions for her family. The staff was quick to take that burden off her shoulders. Even Patty told her to. "I truly want to thank you. I have worked and dealt with many units throughout the health system and I feel that the staff on 6 South are role models for all of us." For its efforts, the Methodist Hospital 6 South Oncology Team was awarded the 2018 Team DAISY Award, which celebrates the extraordinary skill and compassionate care given by nurses every day. The award now hangs with other honors on the floor. As the end neared, Patty decided to go home. The “amazing” mother, friend and coworker died after four days in hospice care. But she’s not forgotten, and her time at Methodist Hospital is part of a bittersweet final chapter. “We couldn’t have asked for better care,” Shelley said. Read Shelley Hultman’s nomination of the Methodist Hospital 6 South Oncology Team for the DAISY Award.